MBCR officials blame the fall in ridership on factors such as a delay in delivery of a new fleet of train cars. 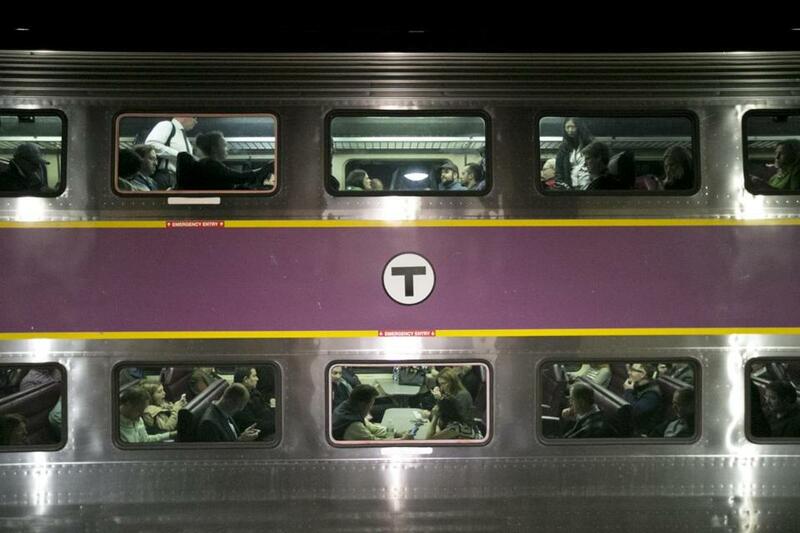 Massachusetts’ commuter rail system, once plagued by delays and widespread consumer dissatisfaction, has succeeded in improving its service, but is wrestling with another persistent problem: a decline in ridership. Bucking national trends, fewer people ride the commuter rail now than 10 years ago, when MBCR took over running the rail service, the state’s largest operating contract. That contract is up for renewal in June 2014, and the Massachusetts Bay Commuter Railroad Co. is facing competition. According to ridership records maintained by the American Public Transportation Association, between spring 2003 and the same period in 2013, average weekday ridership for the Massachusetts commuter rail fell by 12.5 percent — even though the populations of counties served grew between 2000 and 2010. Gregory Sullivan, research director at the Pioneer Institute, a public policy research center, said the drop-off under MBCR’s management should serve as a red flag. MBCR spokesman Scott Farmelant blamed the decline on several factors outside the company’s control, arguing that the decrease does not call into question whether the company deserves to continue operating the train system. “MBCR is an experienced operator with deep institutional knowledge of the MBTA commuter rail system and a clear vision to deliver even more value, innovation and progressive hiring practices,” Farmelant said in a statement. The commuter rail’s contract ends in June 2014, and two bidders are vying to run the system for the next 10 years: MBCR, headed by former MBTA officials; and Keolis, an international transit giant. Officials are expected to select the winning bid early next year. While MBCR’s ridership has fallen, ridership on the MBTA subway system and on commuter rail systems around the country have grown sharply. According to springtime average weekday ridership, eight of the country’s 10 largest commuter rail systems have posted growth since 2003, most of them in the double-digits. In New York, the Metro-North system increased springtime ridership by 15.39 percent. Philadelphia’s commuter rail system is up by 29.96 percent. The only other system to see a decrease is the Long Island Rail Road, which saw a ridership decline of .97 percent. Farmelant said the drop-off in Massachusetts could be attributed to unemployment during the recession, pointing out that the lowest ridership figures over the last decade occurred six months after the state had its highest unemployment rate of the recession. Earlier ridership decline, he said, was the result of Massachusetts’ unusually slow economic recovery after Sept. 11, and fare increases instituted by the T.
Jose Gomez-Ibanez, professor of urban planning at Harvard’s John F. Kennedy School of Government, agrees that a number of factors probably led to the ridership decline, but doubted that employment and fare increases had much to do with the long-term decrease. After all, he said, commuter rail systems around the country have all faced the effects of the recession and raised fare prices but have increased long-term ridership. Gomez-Ibanez said he suspects that customers’ perception of a deteriorating level of service plays a role. Farmelant denies that customer dissatisfaction has contributed to lower ridership numbers and points out that some of the country’s other commuter rail systems — especially those that have demonstrated significant increases in ridership, such as Philadelphia’s system — invested large amounts of resources to expand their system and add new commuter rail lines. That’s an opinion echoed by the MBTA. Spokesman Joe Pesaturo defended MBCR, saying that factors controlled by the T, not the commuter rail company, caused the decrease in ridership. In addition to the expected delivery of new train cars, MassDOT purchased the Worcester line tracks earlier this year, which will allow the transit agency more scheduling flexibility to ensure that trains run on time. “We are absolutely certain that all of these improvements will lead to growth in commuter rail ridership in the coming months and years,” Pesaturo said. Robert Paaswell, former executive director of the Chicago Transit Authority, agrees that most of the factors leading to MBCR’s declining ridership are outside of the operators’ control; though Elliot Sander, former chief executive of New York’s Metropolitan Transportation Authority, said it’s impossible to determine what mix of factors affected the rail’s ridership numbers. However, Sullivan said he believes the declining ridership can be attributed directly to customer dissatisfaction — particularly when it comes to punctuality. “The number one problem is on-time performance of trains and reliability,” Sullivan said. MBCR officials maintain that, for eight out of the last 10 years, more than 95 percent of trains have arrived on-time — the requirement stipulated by the T if the company wants to avoid financial penalties. But being on time has a complex meaning: Amendments to the contract over the course of the last decade have added exceptions, discounting late trains from fines for reasons such as winter weather, crowding, or mechanical problems. As reported by the Globe in 2011, T officials waived or redefined provisions in their contract with the commuter rail company that demanded $32.6 million in fines for failures to deliver up-to-snuff service, without ever discussing the changes in Massachusetts Department of Transportation board meetings. The changes, viewed in light of widespread train delays, gave many the impression that the company had little incentive to improve customers’ experiences. Historically, late arrivals on commuter rail trains have been blamed on aging infrastructure and, increasingly, a shortage of train berths at an overtaxed South Station. The commuter rail company does not own the cars or locomotives that it operates. MBCR has been waiting on a new fleet of cars from Hyundai Rotem, which the MBTA purchased in 2008, but whose delivery has been repeatedly delayed. The bulk of them are scheduled to join the commuter rail fleet in the next year. Farmelant also countered the idea that there are more late trains than reported: For each of the last 12 months, he said, less than 10 percent of trains arrived late — regardless of whether it was a delay for which MBCR is considered responsible. He also pointed out that when there were modest increases in ridership, they were during times when the company failed to meet its on-time performance requirements, raising questions about the theory that late trains lead to fewer riders. Farmelant added that MBCR remains the fifth largest commuter rail system in the country. Semiannual customer counts conducted internally, he added, suggest that ridership may be on the upswing. But two years ago, in the winter of 2011, more than 20 percent of trains were significantly late, causing widespread customer dissatisfaction. Paul Regan, executive director of the MBTA Advisory Board, a consortium of cities and towns served by the MBTA and commuter rail system, said the disastrous winter angered commuters, who haven’t yet forgotten. Some riders remain vexed over what they say is enduring spotty service. Audrey Valeriani, who works as a legal assistant in the Back Bay, has been so angered with commuter rail service that she filed a complaint with the attorney general’s office this year. Stephanie Pollack, associate director at Northeastern University’s Dukakis Center for Urban and Regional Policy, said she believes customer dissatisfaction was part of the commuter rail’s problem — but the ridership drop-off, she said, was also probably a product of more people leaving the suburbs and moving back to the city. Some observers consider MBCR the favorite to win the new contract, just as it was 10 years ago, if only because of its intimate ties with the MBTA and the crossover in top personnel between the two organizations. The management level at the Department of Transportation and the MBTA is abundant with former Massachusetts Bay Commuter Railroad Co. staff, including Secretary of Transportation Richard A. Davey — former general manager of the commuter rail — who has said that he will recuse himself from the decision. The commuter rail company was founded by Jim O’Leary, former general manager of the MBTA. And last month, Charles Planck, former director of planning for the commuter rail, was promoted to one of the T’s top spots: assistant general manager. The company’s sole competitor is Keolis — a prominent international transit company that is considered somewhat of a newcomer to the United States market. Its parent company in France has received mixed reviews, with ridership increasing but also heightening complaints about too-crowded trains and late arrivals. One outside survey put customer satisfaction for the parent company at 49 percent, though internal figures say customer satisfaction is 89 percent. In Keolis’s single heavy rail operation in North America — the Virginia Railway Express, a commuter rail service between Washington, D.C., and its Virginia suburbs — internal evaluations of customer satisfaction have increased in the three years since Keolis took over the system. Alan Eisner, spokesman for Keolis’s bid in Massachusetts, declined to comment on MBCR’S ridership statistics. Even with MBCR’s falling ridership and past problems, some question whether Keolis will get a fair shake.